We had a great time last Sunday participating in the first Jacksonville Wedding Venue Tour, hosted by our friends at The Wedding Loft. The premise is that brides and grooms visit four venues, all set up as they would be for a wedding, and they get to enjoy food and entertainment while meeting great wedding professionals. It's like a bridal show on wheels! We were at The Carling, which is an interesting historic venue in Downtown Jacksonville. The building was formerly the Carling Hotel/Hotel Roosevelt, built in 1925; now it's home to gorgeous apartments! Restored architectural features include Palladian windows, terrazo floors, and a beautiful marble staircase to the private event space. Thanks to J'Adore Studios for the fun photos! To see more photos from the tour, check out Liz's blog post. 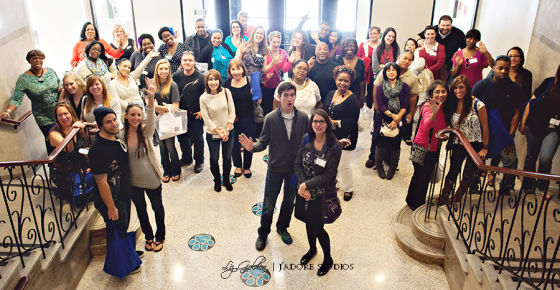 The Jacksonville Wedding Venue Tour attendees on the bus!